MIDDLETOWN, RI – March 5, 2012 – In a move recognizing the growing demand for enhanced data applications in the commercial shipping industry, V.Ships, the world’s largest independent ship manager serving a fleet of over 1,000 vessels, has selected the mini-VSAT Broadbandsm service from KVH Industries, Inc., (Nasdaq: KVHI) as its preferred satellite communications solution. 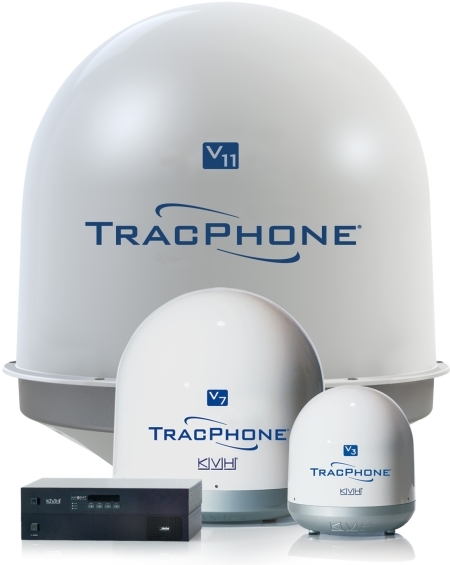 V.Ships intends to promote KVH’s TracPhone® onboard terminals and the global mini-VSAT Broadband service to its customers through SeaCom Electronics Ltd., a fellow member of V.Group, V.Ships’ parent company. The mini-VSAT Broadband service is unique in that it uses ArcLight® spread spectrum technology developed by KVH’s satellite technology partner ViaSat (Nasdaq: VSAT). The service offers a broad seamless web of multi-megabit service created by 14 Ku-band satellite transponders, and will soon cover 95% of the earth with overlayed coverage from three global C-band transponders. In most regions, vessels enjoy redundant coverage to assure robust connectivity. The spread spectrum technology enables use of antennas as small as 37 cm for the Ku-band service and as small as 1 meter for the combined C/Ku-band coverage. KVH is the only maritime VSAT provider to manufacture its own fully integrated onboard terminal, own and operate a global VSAT network, and provide worldwide 24/7/365 after-sale support. Installation and technical support for V.Ships’ customers will be handled by SeaCom Electronics Ltd., a leading supplier of communication, navigation, and entertainment solutions for the merchant fleet including the cruise, ferry, and yacht industries. SeaCom will distribute KVH TracPhone satellite communications systems and the mini-VSAT Broadband service, as well as KVH’s TracVision® satellite TV systems. SeaCom will be supported by KVH’s key account manager, Niels Reuther, from the company’s EMEA headquarters in Denmark.